The camel spider – also known as the wind scorpion or sun spider – has taken its place amongst many tall tales and urban legends. They are technically not spiders (which are within the order Araneae) as they are in the Solifugue order, which translates from Latin as “those that flee from the sun”. They are desert-dwelling opportunistic carnivores that hunt nocturnally and flee from the sun during they day. Although camel spiders sightings are most often reported in the Middle East, they are also species native to the Southwest United States and Mexico. Troops coming back from the Middle East have only added more infamy to the already existing stories. So what is fact and what is fiction? Camel spiders get their name from eating the underbellies of camels. It might be that they got their name because these creatures hide from the sun and could have often been found in the shadow of camels. Although this order spans across the world, they are only found in arid and dry desserts. True of False: They will scream as they run after humans. Often people have felt that camel spiders are chasing them but really they are chasing their shadow and the shade. If a person stands still, the camel spider will stay in the shade of the shadow cast. Camel spiders do not scream, some species will hiss but most do not make any sound. Camel spiders will shun the sun and during the day seek either shade or a place where they can dig a burrow to get out of the sun. 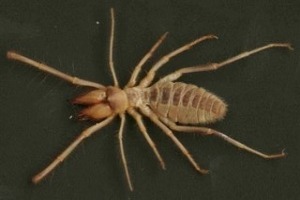 However at night, light will attract a camel spider and they will run towards it. Most often, camel spiders will hunt at night and seek burrows or shade during the day. True of False: They can run up to 30 miles per hour. Camel spiders are fast in comparison to other invertebrates but 30 miles per hour is quite an exaggeration. The fastest camel spider can reach speeds of 10 miles per hour over a very short distance. To give a sense of their speed that is equivalent to running a six-minute mile. True or False: If you put a camel spider on a basketball, its legs can touch the ground. Their have been many pictures of camel spiders that been doctored to make them look much larger than they actually are. Camel spiders can grow to, at most, a length of six inches including their legs. In one picture I came across, a camel spider is compared to a package of cigarettes, although it wasn’t the Camel brand. True or False: They have been known to anaesthetize sleeping humans and gorge on large chunks of their flesh, so much in fact they their bodies swell to the point that they are unable to move. Camel spiders will eat insects, bugs, lizards, and perhaps small snakes but they are not known to eat prey bigger than they are. They will gorge if given the opportunity; their abdomen will swell and they can barely move after a large meal. Camel spiders are aggressive and if they are cornered or feel threatened they will bite. They have no venom glands and rely on a strong and crushing pincer known as the chelicerae to bite. Their bite is painful and if left untreated can cause infection. However, if a person does not antagonize a camel spider it will not bite. Camel spiders in reality have more bark than bite. They look quite sinister but are fairly harmless to humans. However if you are a scorpion or insect in their path – well that’s another story. Thanks for sharing this useful article about camel spider. Some of the facts you mentioned in your post are a must know for anyone who is looking to know more about these spiders. Here I would also like to share a website (camelspider.org) where people can find more facts about this specie. TThanks for clearing things up! Cathleen (Cat) is the former Special Projects Manager at California Academy of Sciences and worked in the public programs division. Before working at the Academy, Cat got her start as an intern at Lindsay Wildlife Museum for four years and worked with animals ranging from snakes and hawks to foxes and bobcats. She has a deep curiosity about the natural world and native California wildlife.